Do You Suffer From O/CD Syndrome? I used to track every new musical acquisition – CD, LP, cassette or download – in the so-called O/CD Tally, here on the blog and then, briefly, in its own Twitter feed. Appropriately titled, the O/CD Tally fed into my very real obsessions as a music lover and list maker. When I first started it, I faithfully tracked everything sent or purchased for a year and, on New Year’s Eve, wrote down the last few albums that tipped me over the 1,000 mark for the previous 12 months. In subsequent years, the list became harder to maintain accurately since so much of what I was counting came in digital form. When a friend started sharing his digital library last year – including a 10,000+ collection of vinyl that he was painstakingly converting to mp3s – the idea of counting seemed pointless since I could so easily inflate the numbers from his stuff and the more-than-I-could handle offerings from publicists and free, legal services like Noisetrade and Bandcamp. So the O/CD Tally bit the dust. But I still miss making lists! And so, after spending a most delightful time yesterday at my favorite local used CD store – CD Cellar (Falls Church location) – I typed up all the goodies I came home with, and now throw it online because…well….having typed it up anyway, why not? As usual, I tried not to spend any real cash money. Instead, I filled my Wilco (The Tote) bag full of carefully culled vinyl and CDs from the Should-Be-a-Study room. While there were a few items that could be resold for a good price – like JT’s “20/20 Experience” CD (I got the vinyl on clearance at Target for $9) or the Joan of Arc gatefold LP for “Flowers” (a Polyvinyl super sale for $3.50, I didn’t like it as much as I thought I would, so the download is enough) – the bulk of the bag was admittedly, old and obscure (but not in a good way) stuff, like a dozen samplers from old CMJ and Mojo magazines. So I took the $39 store credit and turned it around for a greater good. My husband is also relieved anytime I go out and come home with a smaller bag of stuff than the one I left with. Which can be tricky when I hit the clearance section – two long shelves of CDs that sell for $1.99 each (or $3.99 for double disc sets); 10 for $15.99, or 20 for $25.99. Of course, once I get anywhere close to 10, or 20, I round up to get the better deal. This day, that meant 17 new CDs (2 DVD’s and 1 double CD included). That means that these CD’s cost $1.30 each ($2.60 for the double)! Beat that, Best Buy! NINA SIMONE – Remixed & Reimagined (2006, RCA/Legacy) An example of something I wouldn’t know I needed until I saw it. The ROCHES – A Dove (1992, MCA) Someone must have cleaned out their collection, as there were a half dozen albums available by these three lovely sisters. This is one I don’t know. The ROCHES – Keep On Doing (1982, Warner Bros.) The one produced by Robert Fripp. The title song/”Jerks on the Loose” is a longtime favorite for days when things go wrong. This one replaces vinyl. AZTEC TWO-STEP – Live & Rare (2001, Red Engine Records) This 2-disc set has two scrawled signatures on the front cover which match the names of the guys, so I’m taking it on faith that it’s genuine. Saw them once in college and have had a soft spot for them since. JESSE MALIN – Glitter in the Gutter (2007, Adeline/East West) Liked the sound of two titles – “Don’t Let Them Take You Down (Beautiful Day!”) and “Bastards of Young” (trusting it’s Replacements cover). SMOKE & JACKAL – eponymous (2012, RCA) A 6-track EP by Jared Followill from Kings of Leon and Nick Brown (the sticker says he’s from Mona). Why didn’t I hear about this? BAGDAD CAFÉ – Original Soundtrack (1988, Great Jones/Island) Somewhere in the past, I sold the vinyl for about $20. Will be nice to hear “Calling You” again. SONDRE LERCHE – Don’t Be 1996, Shallow EP (2003, Astralwerks) 8 songs, 4 of them live. There’s a chance I might have this in the racks at home, but I couldn’t risk it. 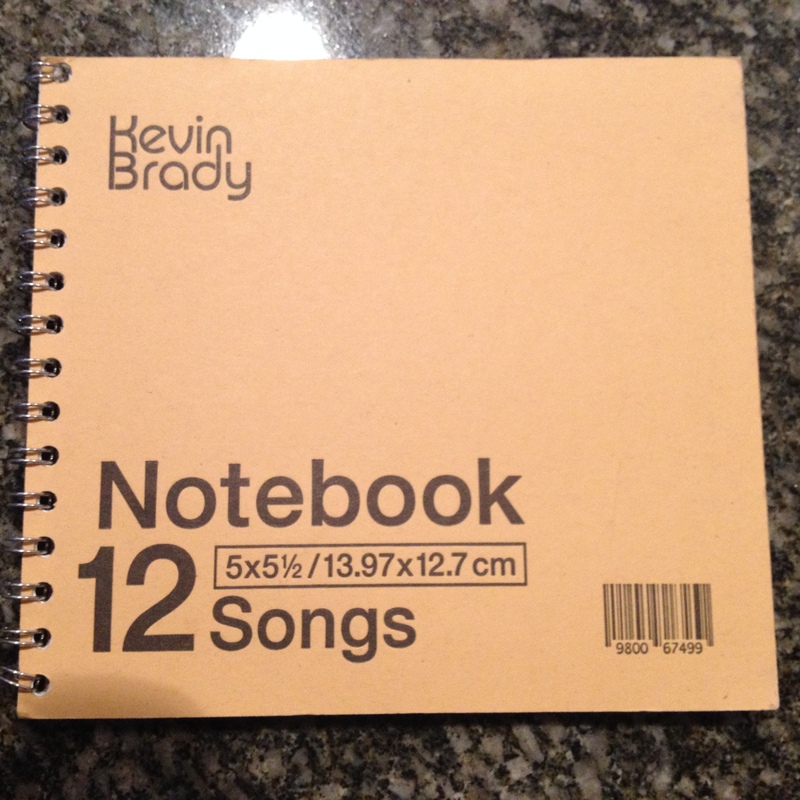 KEVIN BRADY – Notebook/12 Songs (1999, self-released) Purchased solely for its great packaging. I need to post a picture of this one, ‘cause it’s so well designed. 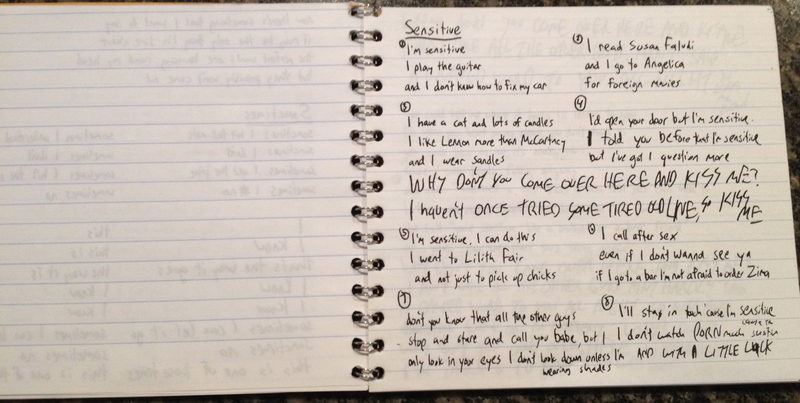 Some clever songs, too. I will be doing further research on this guy. Example of the inside pages of Kevin Brady’s CD. DAWN LANDES – Fireproof (2006, no label listed, but Wikipedia says Cooking Vinyl released a version) Another purchase for packaging – a cardboard cover with letterpress printing and fold-out poster in lieu of liner notes. I recognize the name as being someone who opened a concert I attended in the recent past. Don’t remember which one, didn’t see her perform, but the fact that she was on the bill with someone I wanted to see suggests that she may well be compatible with my tastes. JONI MITCHELL – Hits (1996, Reprise) I have pretty much every Joni album I’ll ever need, but this will be handy in the kitchen for my husband, who’s a big fan – and does the cooking. GREY’S ANATOMY – Original Soundtrack, Vol. 1 & 2 (2005 and 2006, Hollywood Records) Pretty much selected for my two daughters, who love the show (they won’t let me watch with them ‘cause I make too many jokes about the bizarre plot lines) and to bring me over the magic 20 mark. IVY – Guestroom (2002, Minty Fresh) $3.99 Another hubby favorite. Also very cleanly designed and, I learned upon looking it up, a covers album. a sign that O/CD is a very real syndrome. And remember, if you know someone who suffers from O/CD Syndrome, be kind. Give them a gift certificate to a music store or better yet, some storage! As ever, thanks for stopping by.